Ever since horrifying images of famished children hit our screens back in the 1980s, there has been a stigma attached to Ethiopia – one of a deeply impoverished nation, strangled by starvation. And, for some time, it was. But what may not be as widely known today is the utterly remarkable progress Ethiopia’s economy has made over the past decade. 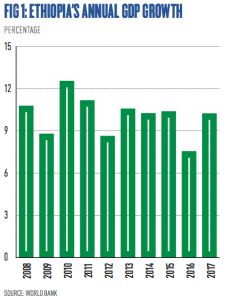 The country has in fact achieved double-digit GDP growth on average for the last 10 years (see Fig 1). Yes, Ethiopia has come a long way in a relatively short period of time, and yet, it’s still just at the start of its extraordinary story. Perhaps what had been missing from the tale until now was a charismatic protagonist. Enter Abiy Ahmed, as of April 2, Ethiopia’s 15th prime minister. 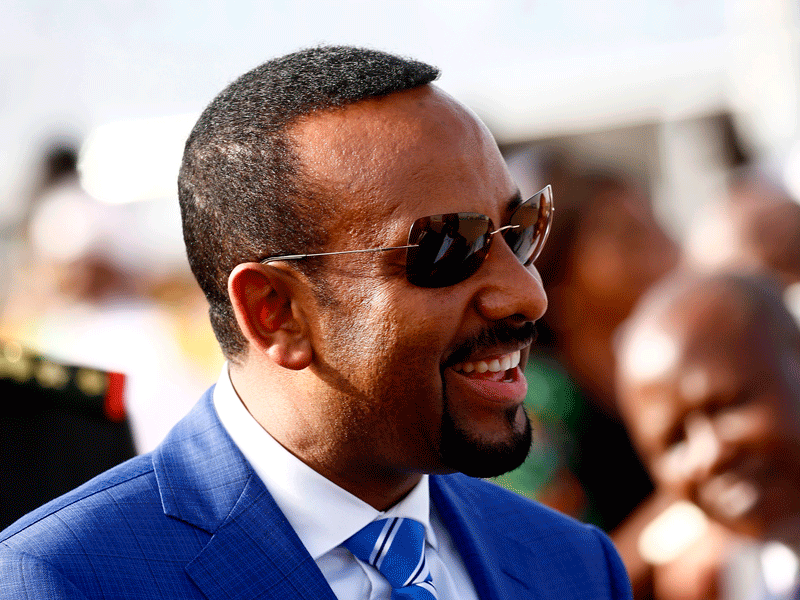 Abiy has taken the country by storm, and in just a few months has achieved what most leaders could only hope for during an entire tenure: establishing peace with neighbouring Eritrea; rousing a disenchanted population; pushing forward with key infrastructure development; opening up the economy to further financial investment; and winning support from the Ethiopian diaspora. Heading up the Oromo People’s Democratic Organisation – one of four parties comprising the Ethiopian People’s Revolutionary Democratic Front coalition – Abiy is Ethiopia’s first prime minister from Oromia, the country’s biggest ethnically based state. “That really seems to matter to some of the tension of Ethiopian politics,” said Christopher Cramer, Professor of the Political Economy of Development at SOAS University of London. Though they comprise around one third of Ethiopia’s 100-million-strong population, the Oromo people have been marginalised for decades. Increasing violence, anti-government rallies and deadly clashes have dominated Ethiopian politics for the past three years in particular. Since Abiy came to the fore, however, significant progress has been made to quell the dissent. Of note, a new amnesty law was introduced, releasing political prisoners and reversing the overzealous security measures that have long inflicted the country. In freeing prominent journalists and opposition leaders, Abiy has successfully begun the difficult task of rebuilding trust in a faction that had long been discontented with the government. In August, Abiy signed a new peace agreement with the Oromo Liberation Front, consolidating this new phase in the country’s stability. Abiy’s background plays a significant role in his widespread support. Highly educated, he has a master’s degree in transformational leadership from the University of Greenwich and a PhD in peace and security studies from Addis Ababa University. Though he rose to the rank of lieutenant colonel during military service, Abiy also served as a UN peacekeeper in Rwanda in 1995. Abiy then gained prominence when he founded the Information Network and Security Agency in 2007, and continued to work as director of the organisation responsible for Ethiopia’s cybersecurity. In 2016, he was appointed as the Minister for Science and Technology. At 42, he’s the youngest leader on the African continent. His youth is reflected in his style of leadership, his stirring rhetoric and the speed with which he is taking action – in short, Abiy is a breath of fresh air. Since coming to power, he has made moves to modernise the economy and loosen the monopoly of key sectors. This news is a boon to the aviation industry in particular, given Ethiopian Airlines’ status as Africa’s largest and fastest-growing airline. Competition for a 30 to 40 percent stake in state-run Ethio Telecom is also heating up. Regionally, Abiy has already made his mark. In June, he visited Egyptian premier Abdel Fattah al-Sisi to break a deadlock hindering the construction of the star in Ethiopia’s infrastructure development plans – the Grand Renaissance Dam (GERD). Fearing a reduction in Egypt’s water supply, Sisi had expressed “grave concern” about the mammoth hydroelectric project. A pledge in person from Abiy, however, saw the pair reach an agreement on Ethiopia’s work on the Blue Nile. Then, of course, came Abiy’s monumental announcement (also in June) that Ethiopia would accept the 2000 Algiers Agreement, signalling long-awaited peace with Eritrea. The news marked the resumption of trade between the countries; interstate flights have commenced, while phone lines have also been re-established. With Ethiopia once being Eritrea’s largest trading partner, the potential gains are a game-changer for both countries. Naturally, a number of the successes sparking international admiration were already underway before Abiy came onto the scene. 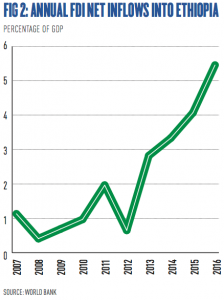 Indeed, last June, the World Bank labelled Ethiopia the world’s fastest-growing economy. According to a new report by the organisation, its GDP growth for the 2017 fiscal year reached an enviable 10.9 percent, while growth for the period from July 2017 to June 2018 is forecast at 9.6 percent. “It’s very important to stress that it is not only a sustained period of very rapid growth, it was actually achieved in a country that is not resource-rich,” Cramer told World Finance. “It’s not a matter of being driven by oil, diamonds and so on. So it is quite an unusual record and very important in the context of sub-Saharan Africa.” Despite this lack of resources and the fact that it is landlocked, Ethiopia has managed to increase its GDP tenfold since 2000. Extreme poverty, meanwhile, dropped by over 20 percent between 2000 and 2011. Ethiopia’s shift from recurrent to capital expenditure has formed the foundation of the country’s socioeconomic transformation, its focus on infrastructure development in particular being instrumental. Despite its rapid GDP growth, Ethiopia’s woeful transportation infrastructure has acted as a stranglehold on the economy for decades. In 1990, the country – which is around twice the size of Texas – had just 19,000km of roads. Transforming this situation has been crucial. Thanks to the government’s refocused spending ($11bn has been spent on roads over the past two decades) together with a growing inflow of foreign investment (FDI has increased fivefold from $814.6m to $4.17bn between FY 2007/08 and FY 2016/17), by 2015 Ethiopia’s roads stretched 100,000km around the country. Showing no signs of abating, today foreign investment continues to bolster the network, while 20 percent of the government’s infrastructure spending is dedicated to road building, equating to $1.7bn annually. Railway construction is another symbol of the government’s determined strategy. In September 2015, a new 32km light rail system opened in the country’s capital, the first of its kind in sub-Saharan Africa. The Chinese-funded project has enabled some 60,000 citizens from the city’s suburbs to travel into the centre for work – and affordably, too. Further plans are in the pipeline to connect the electrified network with the national train system by 2025, earmarking the government’s plans to become a transportation hub for neighbouring countries. The 750km-long electric railway connecting Addis Ababa to the Red Sea via the Port of Djibouti best encapsulates this aim. Inaugurated in October 2016 and beginning commercial operations in January 2018, the line reduces transit time from two-to-three days to around 10 hours. With faster and cheaper access to the sea through Djibouti, the railway is a boon to the country’s burgeoning manufacturing sector. Such infrastructure development has obvious effects on the economy, but there is another reason pushing momentum forward so rapidly: Ethiopia’s vision to become a manufacturing hub. In recent years, the nation has boasted formidable success in using its very competitive rates to persuade foreign manufacturers to set up shop in the country. One of the first such manufacturers was Huajian Group, a Chinese shoe manufacturer that employs around 4,000 people in an industrial park outside the Ethiopian capital. Big-name clothing brands have since followed suit, including the US’ Gap, Germany’s Tchibo and Sweden’s H&M. In 2017, the industry received another windfall when not one but three fashion giants set up factories in the country: PVH, of Calvin Klein and Tommy Hilfiger fame; Velocity Apparelz Companies, which boasts the likes of Zara and Levi’s; and Jiangsu Sunshine Group, the manufacturer for Hugo Boss and Giorgio Armani. According to Ethiopia’s investment commission at the time, a further 150 companies from China and India would soon begin sourcing production from Ethiopia. Ramachandran, who co-authored the 2017 paper Can Africa Be a Manufacturing Destination? Labour Costs in Comparative Perspective, shed light on the shift: “Manufacturing, particularly light manufacturing, is… driven by the cost of labour. That’s a very critical component in the overall cost, and Ethiopia’s manufacturing sector is competitive globally.” Indeed, Ethiopia’s low labour costs put it in direct competition with market leaders like Bangladesh. Though Ethiopia is the rising star of light manufacturing, challenges remain, ranging from those of bureaucracy to issues with cotton quality. However, most pressing is the issue of energy stability. For too long, energy apartheid has stifled countries in sub-Saharan Africa – Ethiopia being no exception. “Power outages have for a long time been a major constraint. And the [greater] the demand for energy power – as with more investment and manufacturing and in high-value agriculture commodities – the bigger that constraint becomes,” said Cramer. As Ramachandran notes, the government is indeed aware of the importance of overcoming this particular challenge. Fortunately, it is taking advantage of the country’s hydroelectric potential and has built a number of dams in recent years, that which has grabbed the most attention being the aforementioned GERD. And for good reason: its potential is tremendous. With an expected generation capacity of 6,450MW, the GERD project is set to become the biggest dam in Africa, and according to The Ethiopian Messenger will “triplicate Ethiopia’s consumed energy”. Significantly, the GERD will also act as a driving force for exporting electricity to neighbouring nations, which in turn will prove crucial to generating foreign exchange. Indeed, the dam has become a powerful symbol for the country. Costing a whopping $4.7bn, the GERD has been funded and constructed almost solely by Ethiopians, marking a monumental step in the state’s ability to stand on its own two feet and demonstrating its status as a regional power. As explained by Cramer, Ethiopia has also demonstrated the value of learning from others – speaking to various organisations and experts, studying the development of other economies and learning from their pitfalls. In the case of Ethiopia, having a strong, coherent leadership in place, which is steadfastly focused on a long-term strategy, has been crucial in this approach. Now with Abiy at the helm, the economy has received yet another boost, thanks in large part to his quick work and charisma. Today, the country is more stable than it has been for years – foreign investors are further motivated, while the population is amply inspired. The time is ripe for the country to firmly push itself into the next phase of its development: becoming a hub for sub-Saharan Africa in terms of manufacturing, transportation, energy and economic leadership. With more reliable energy soon to follow, the country’s grand ambitions are actually within reach. Ethiopia’s economic story is truly extraordinary – and the best part is, it’s not over yet.